A Brock student is making international headlines and lighting up the Internet with video footage of her incredible bungee jump in Whistler, B.C., last week. Christine Rougoor is a Master of Education student at the University and nearly two years ago, she was partially paralyzed in a motocross accident. Since taking the plunge, Rougoor’s incredible feat has been featured on news websites like CNN, The Daily Telegraph and ABC News. She is also scheduled to appear on CTV this Friday. Her jump was made possible by the group 9Lives Adventures, which specializes in disabled adrenaline tourism. She was one of three finalists in a video contest that earned her an all-expenses-paid trip to Whistler to go backcountry snowmobiling and bungee jumping. Rougoor, who is from Niagara Falls, is a talented visual artist and teacher in training. She completed her undergrad at Brock and was recipient of the Board of Trustees Spirit of Brock medal for the Faculty of Humanities at Spring convocation in 2011. She is an ambassador for the Rick Hanson Foundation, a peer support person for the Canadian Paraplegic Association, and an inspirational public speaker. 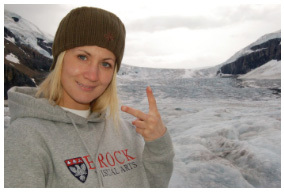 She also lives a very active life – participating in marathons, conquering ice fields. Only three months after leaving the hospital, she took part in the Rick Hanson Wheels In Motion event at Brock. Three months later, she returned to classes. Since her accident she has completed two marathons and helped raise more than $50,000 for spinal cord research.